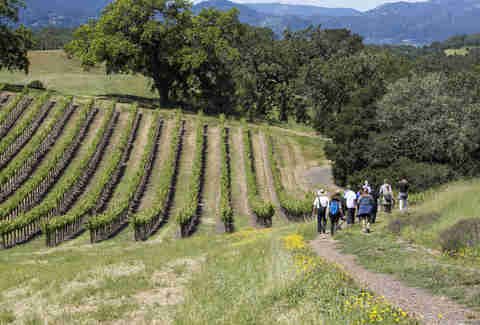 Located ninety minutes north of San Francisco in the heart of Sonoma County, the area around Healdsburg is internationally famous for its wine -- this is where the Russian River Valley meets Dry Creek Valley and Alexander Valley, after all -- but the town is also known for its vibrant local food scene: it's the ground zero for farm-to-table cuisine. Despite all the restaurants, wine tasting rooms, and galleries, Healdsburg still retains its small-town charm, and it's this laid-back, unpretentious style that comes across in both the food and ambiance. 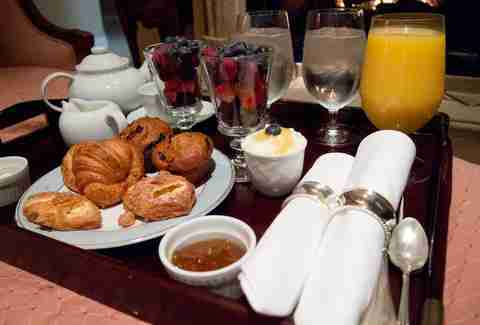 These are our favorite spots where you can get to know this area, where comfort trumps formal dining, and everyone's happier for it -- plus our picks for where to stay after a long day of indulging. Brothers Chef Dustin Valette and Aaron Garzini cook and greet guests at this high-end, chic restaurant, which has a reputation for beautifully constructed, artistic food plates and minimalist decor. A canvas for local farmers and winemakers, we'd recommend the chef’s tasting menu (and spring for the wine pairing). Highlights include Hawaiian ahi poke, summer squash soup, and char grilled prime New York steak. For dessert, your options only get better: go for the strawberry jam toasted brioche with salted brown butter ice cream, or the popular Chocolate Bloc, a chocolate mousse with sea salt and toasted meringue. SHED is everything you’ve ever wanted in a food space. It’s a café, coffee bar, produce market, restaurant, wine bar, and store. 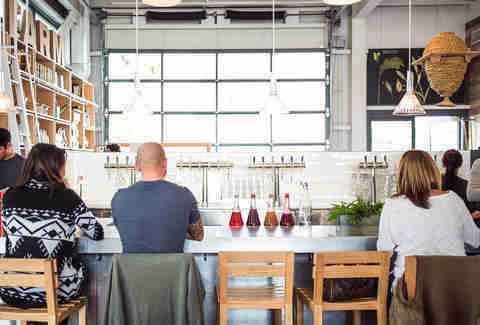 This is California’s answer to Eataly, plus it offers a fermentation bar, which serves homemade kombucha on tap, kefir water, and shrubs. Plan to spend a few hours eating, shopping, and generally perusing food nerdery, including cookbooks, fancy cooking utensils, herbs, and wines. The stylish, barn-like atmosphere of this farm-to-fork restaurant is genuinely gorgeous (just soak in that spacious garden patio), so it's no wonder that a lot of people are hosting weddings here. Barndiva’s motto, "Wherever you are, eat the view," speaks to the view on your plate: it's stunning. 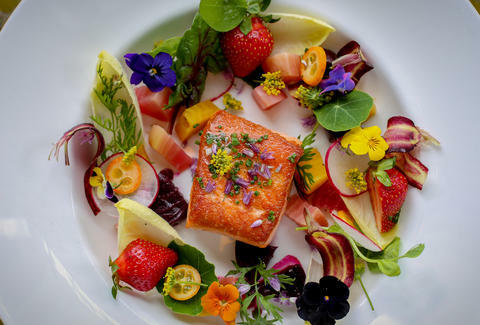 Prepare for plenty of edible flowers and dishes that look like paintings, and a focus on fresh, seasonal vegetables and fruits. Start with the house Champagne cocktail, made with orange peel infused with Korbel brandy, coriander syrup, and Creole bitters. OK, we almost lost our minds when we discovered this place: only in Healdsburg would you find a pie bar that makes crust from old-world grains like bolero, faro, and buckwheat, and pairs them with mind-blowing, homemade artisanal ice cream flavors like pumpkin chocolate and corn flake crown maple. 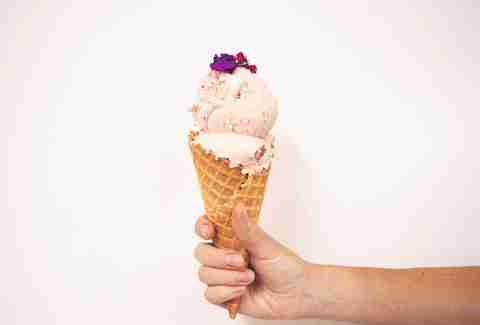 The staff especially recommends the following pairings: spiced apple pie with salted caramel ice cream, lemon custard pie with lemon lavender ice cream, or the maple chocolate walnut pie with organic vanilla bean ice cream. We're here for all of them. Otherwise know as FGC, you'll want to show up early here... but not too early. Pour-overs don’t start until 8am, after all. In a town that takes its food seriously, Flying Goat is no exception: the coffee is strong, the staff knowledgeable, and the atmosphere stark. Inspired by the Bordeaux tradition, this vineyard make only two wines: Alexander Valley cabernet sauvignon and Russian River Valley Chardonnay. Located just outside town, Jordan Winery offers daily wine tastings, but you can also arrange for guided tours of the estate’s scenic vineyards, lakes, chef's garden, and apiary. While you tour the grounds, you can taste their wines and olive oil, while sampling food pairings from the chef. Chef-owner Mateo Granados was executive chef at Charlie Palmer’s Dry Creek Kitchen before opening Cocina Latina, a nod to his Mexican roots. He sources local vegetables in season and sustainable meats from nearby farms (all listed on the menu). Some of the menu's gems include tacones, empanadas, and olive oil guacamole. Come here for the mixed drinks or agua fresca, if you need a break from wine tasting (what, it happens). This family-owned brewpub makes award-winning craft beers. Step inside, and chances are there will be a game on (Go Warriors! ), so come here amped up for some crowds and noise. 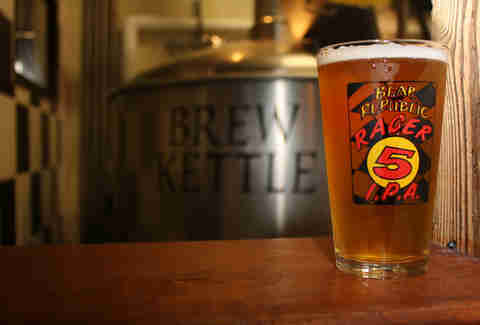 The brewery’s three most popular beers are Grand-Am, Ricardo’s Red Rocket Ale, and Racer 5 IPA, a full bodied, hoppy IPA that's won countless medals. 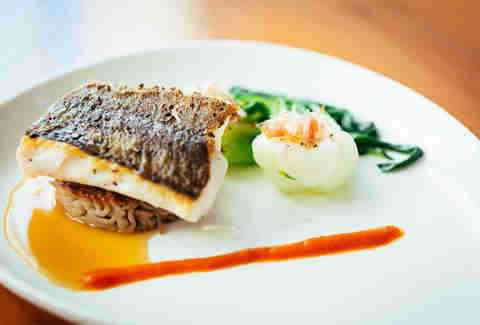 Spoonbar offers contemporary California cuisine in a lofty, open-plan interior. Chefs Casey and Patrick Van Voorhis are well-respected for their unique take on traditional American fare, but the award-winning "farm-to-bar," cocktails made from local herbs and natural ingredients, really shine here. The signature drink, Three Dots and a Dash, packs a powerful alcoholic punch. Also try the Bergamot Blossom, which involves vodka with orange blossom water and raspberry shrub, for a lighter alternative. Moustache serves rich, creamy cupcakes stuffed with everything from homemade jam to cream cheese. They also serve French macarons, seasonal ice cream sandwiches, financiers, and the Moustache-O, which is basically an oversized, organic version of an Oreo cookie. 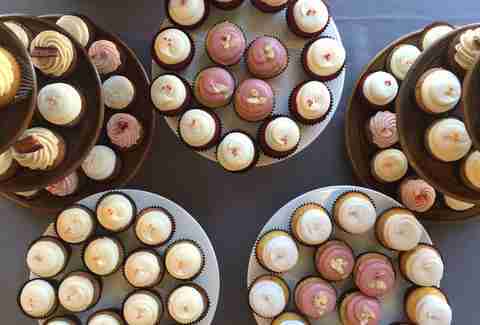 But if you're only going to get one thing, go for the cupcakes -- these may be the best you'll ever eat. Recommended: the Mistress (lemon cake with blackberry rosemary jam filling) and The Outlaw (caramel filled chocolate cake with sea salt.) Oh, they also serve Four Barrel coffee to wash it down. Locals flock to this open-air bistro at lunchtime for the chicken salads, French onion soup, and the artisan breads. We like to order the Cousteau French Dip, with thinly sliced rib eye, Roquefort aioli, and caramelized onions on a classic sourdough roll. Learn how to prepare meals you actually want to eat under the tutelage of owner Donna del Rey. After you prepare dinner, you and your fellow classmates can down to eat the seasonal menu, which includes easy recipes for Pollo alla Mattone (literally chicken under a brick), quinoa with cherry tomatoes, and grilled farm peaches with ricotta and honey. If you're tired of fancy food, grab a pizza and a brew at Campo Fina, then sit out on the patio. After a few slices, you may be inspired to challenge your friends to some bocce on the outdoor court. Rent a bicycle from Wine Country Bikes and peddle out through Dry Creek Valley to the Quivira tasting room. This scenic, hour-long ride along back roads involves minimal car traffic and just a few hills. All of the wines made here are biodynamic -- though you'll want to be tasting that 2015 rosé in particular. You can order a glass and drink it on their outdoor patio, which overlooks breathtaking views of the winery’s vineyards and surrounding region. 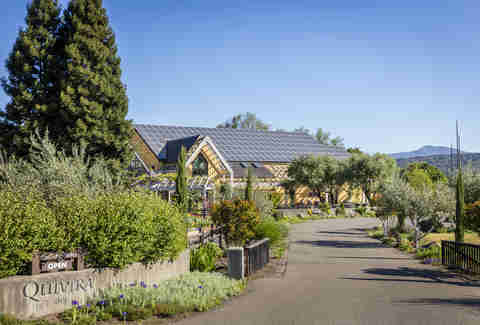 Celebrity chef Charlie Palmer put Healdsburg on the map when he first opened this groundbreaking restaurant for Progressive American cooking at the Hotel Healdsburg. The rest, as they say, is history. Since then, some of the country’s best chefs have followed him here, setting up shop in town. This place is still very much worth dining at, and the kitchen has a list of over 500 wines to pair with your meal (so, you know, we'd call that extensive). Recommended: the garlic-crusted chicken breast with Bloomsdale spinach and baby carrots.